Prototype: 4 type Rens four-axle low side cars with stakes. Privately owned cars of the firm AAE Cargo AG, Zug, Switzerland, leased to the firm Awilog Transport GmbH, Oberriexingen. European standard design with a length of 19.90 meters / 65 feet 3-7/16 inches. Each low side car is loaded with 7 dumping hoppers with tarps for the firm Awilog. The cars look as they did around 2009. Model: The low side cars have type Y 25 trucks. Each car is loaded with 7 dumping hoppers. There are additional transport restraints for the dumping hoppers. All of the cars have different car numbers. All of the dumping hoppers have different hopper numbers. Each car comes individually packaged with its hoppers. Total length over the buffers 496 mm / 19-1/2". One-time series in 2011 for the "Exclusiv" program. Prototype: Havelland Railroad, Inc. AG, Berlin, Germany (HVLE) class 185.5 electric locomotive. Model: The locomotive is constructed of metal, has a digital decoder, and a special motor. 4 axles powered through cardan shafts. Traction tires. The triple headlights change over with the direction of travel, will work in conventional operation, and can be controlled digitally. The headlights are maintenance-free LEDs. Length over the buffers 21.7 cm / 8-1/2". Prototype: German Railroad, Inc. (DB AG) class 110.3. Express locomotive with aerodynamic ends, with the co-called "Pants Crease". "Chinese Red" paint scheme, with an advertising theme. Rebuilt version with square Klatte vents, square engine room windows, without a continuous rain gutter, without skirting, and without buffer streamlining. The locomotive looks as it did around 1996. Model: The locomotive has an mfx digital decoder and extensive sound functions. It has controlled high efficiency propulsion, centrally mounted. 4 axles powered through cardan shafts. Traction tires. The triple headlights and dual red marker lights change over with the direction of travel, will work in conventional operation, and can be controlled digitally. The headlights at Locomotive End 2 and 1 can each be turned off digitally. When the headlights at both ends of the locomotive are turned off, then the function of the "Double A" light is represented. The headlights and marker lights are maintenance-free, warm white and red LEDs. The locomotive has separately applied grab irons. The engineer's cabs have interior details and separately applied control wheels. The roof walks are separately applied. Length over the buffers 18.9 cm / 7-7/16". The passenger car set to go with this locomotive can be found in the Märklin H0 assortment under item no. 43869. This model can be found in a DC version in the Trix H0 assortment under item no. 22667. Prototype: Swiss Federal Railways (SBB) class Re 10/10 double electric locomotive set, consisting of one each Re 6/6 electric locomotive with the city coat-of-arms for "Bischofszell" and an Re 4/4 II electric locomotive. Used mainly on the Gotthard route for long, heavy freight trains. The locomotives look as they did around 1980. Weathered version. 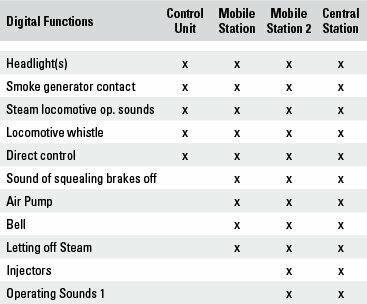 Model: Both locomotives have mfx digital decoders; the Re 6/6 also has factory-installed sound functions that can be turned on and off. Both locomotives each have controlled high-efficiency propulsion. Each locomotive has 2 axles powered. Traction tires. The Swiss headlight code (triple headlights / white marker light) change over with the direction of travel, will work in conventional operation, and can be controlled digitally. The headlights are maintenance-free, warm white LEDs. The locomotives have separately applied metal grab irons. The couplers can be replaced by detailed end skirts. Minimal radius for operation is 360 mm / 14-3/16". Total length over the buffers 39.4 cm / 15-1/2". Prototype: Swiss Federal Railways (SBB) class Ae 6/6 electric locomotive. The locomotive looks as it did in Era III. Model: The locomotive has an mfx digital decoder with extensive sound functions. It also has controlled high-efficiency propulsion. Traction tires. 3 axles powered. The headlights change over with the direction of travel, will work in conventional operation, and can be controlled digitally. Length over the buffers 21 cm / 8-1/4". Prototype: Swiss Federal Railways (SBB) class Ae 8/14 electric locomotive. The locomotive looks as it did in Era III. Model: This Ae 8/14 electric locomotive has an mfx digital decoder and factory-installed sound functions that can be turned on and off. It also has controlled high-efficiency propulsion. Traction tires. 4 axles powered. The headlights change over with the direction of travel, will work in conventional operation, and can be controlled digitally. Length over the buffers 39.1 cm / 15-3/8". Already completely sold out at the factory -- I only have two remaining! Prototype: Class MaK DE 1002 diesel-electric switch engine painted and lettered for the firm Northrail GmbH, Hamburg, Germany. This locomotive has been leased to the firm Seehafen Kiel GmbH & Co. KG since January of 2011. Era VI. Prototype: German Federal Railroad (DB) class 41 steam freight locomotive with a tender and with oil firing. Rebuilt version with a new design, high-efficiency boiler, Witte smoke deflectors, DB Reflex glass lamps, inductive magnet on one side of the locomotive, warning stripes on the buffer plates, and rebuilt tender with an oil bunker. Road number 41 356. The locomotive looks as it did around 1962. Model: The locomotive has an mfx digital decoder and extensive sound functions. It also has controlled high-efficiency propulsion with a bell-shaped armature and a flywheel, mounted in the boiler. 4 axles powered. Traction tires. The locomotive and the tender are constructed mostly of metal. A 7226 smoke generator can be installed in the locomotive. The triple headlights that change over with the direction of travel and the smoke generator that can be installed in the locomotive will work in conventional operation and can be controlled digitally. The headlights are maintenance-free, warm white LEDs. There is a close coupling with a guide mechanism between the locomotive and tender. It can be adjusted for track radius. Close couplers with NEM coupler pockets and guide mechanisms are mounted on the rear of the tender and on the front of the locomotive. Minimum radius for operation is 360 mm / 14-3/16". Piston rod protection sleeves and brake hoses are included. Length over the buffers 27.5 cm / 10-13/16". Prototype: German Railroad, Inc. (DB AG) road number 01 150 express train steam locomotive. This museum locomotive of the Nürnberg Transportation Museum looks as does since being restored, with striking Wagner smoke deflectors and brass-colored boiler bands. The locomotive looks as it did in September of 2011. Model: The locomotive has an mfx digital decoder and extensive sound functions. It also has controlled high-efficiency propulsion and a can motor with a flywheel in the boiler. 3 axles powered. Traction tires. The locomotive and tender are constructed mostly of metal. A 7226 smoke generator can be installed in the locomotive. The triple headlights change over with the direction of travel. 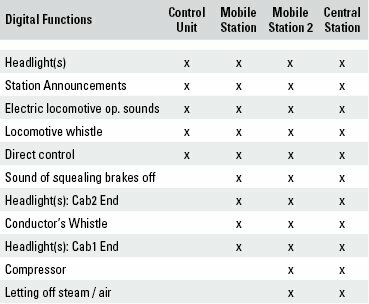 They and the smoke generator that can be installed in the locomotive will work in conventional operation and can be controlled digitally. The headlights are maintenance-free warm white LEDs. There is an adjustable close coupling between the locomotive and tender for different curves. There is a close coupler with a guide mechanism and an NEM pocket on the tender. The minimum radius for operation is 360 mm / 14-3/16“. Märklin is participating financially to a considerable extent in the restoration of the great steam locomotive legends of German and international railroad history. Together with other partners such as the tireless donation collector Olaf Teubert, a former locomotive engineer for road number 01 150, the German Railroad Foundation, and the German Railroad, Inc. have created the financial basis to have road number 01 150 overhauled at the Meiningen Steam Locomotive Works to keep it in operating condition. The locomotive will be operated by the association “Traditionsgemeinschaft Bw Halle P e.V.” which is based at the DB Museum in Halle/Saale. The locomotive will be used in the future in historic railroad service all over Germany. Note: This will be an MHI item for early 2012 -- please make your reservations now if you would like one of these. It will most certainly sell out VERY quickly! Prototype: 3 lightweight steel cars, type A with 3 compartments, 1st class, type B with 2 compartments, 2nd class, and type B with 3 compartments, 2nd class. Used on the Swiss Federal Railways (SBB). The cars look as they did in Era III. Model: The passenger cars are ready for installation of the 7319 current-conducting couplings or the 72020/72021 current-conducting couplers, the 73405 pickup shoe, and the 73400 or 73401 lighting kit (2 per car). Total length of the passenger train 78.5 cm / 30-7/8". Model: The cars have underbodies specific to the different car types. The trucks are Minden-Deutz heavy designs, with disk brakes like the prototype, with and without magnetic rail brakes depending on the car type, and with and without side stabilizers and separately applied generators depending on the car type. All of the cars are ready for installation of the 7319 current-conducting couplings or the 72020/72021 current-conducting close couplers, the 73400/73401 lighting kits (2 per car), the 73406 pickup shoe, and the 73407 marker light kit. Total length over the buffers 84.8 cm / 33-3/8". DC wheel set per car 4 x 700580. 46546 - Pressurized Gas Tank Car Set. The class 41 steam freight locomotive to go with this set can be found under item no. 37927. This model can be found in a DC version in the Trix H0 assortment under item no. 24112, but with different car numbers. Prototype: Privately owned type Habiins 12, for the firm Transwaggon GmbH, Hamburg, Germany. Deep black basic paint scheme. 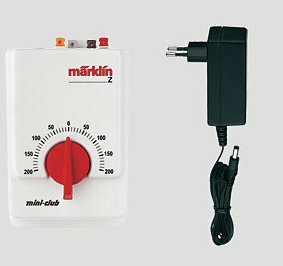 With an attractive, striking Märklin design. The car looks as it currently does in 2011. Model: The car has fixed adjustable buffers and trucks. Length over the buffers 26.7 cm / 10-1/2". DC wheel set 4 x 700580. Prototype: Type OOt coal hopper car with a brakeman's cab. Fictitious Christmas design. Model: The coal hopper car comes in a Christmas design, loaded with gold Christmas tree balls in different sizes and hues. The car has close couplers with a guide mechanism. Length over the buffers 15.9 cm / 6-1/4". DC wheel set 4 x 700580. Attractive addition to the Christmas series. Prototype: Type J3 boxcar, type K3 boxcar, type O pair of swiveling load cradle cars, type F boxcar with a "peaked roof", type M5 stake car. Model: Total length 76.3 cm / 30". This power pack has smooth speed control for gentle starts and power increases in speed up to the maximum speed. It also has single-knob operation for setting the voltage in the track and for changing the direction of travel by turning the control knob away from the center position. Power pack dimensions 130 mm (L) x 70 mm (W) x50 mm (H) / 5-1/8“ (L) x 2-3/4” (W) x 2“ (H). 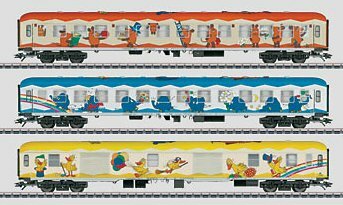 Prototype: German Railroad, Inc. (DB AG) class 110.3 electric locomotive, 3 different design German Railroad, Inc. (DB AG) express train passenger cars, with different advertising themes. 1 type WGmh 824 entertainment car, with the main design theme of "Maus" / "Mouse". 1 type Bm 235 compartment car, 2nd class, with the main design theme of "Elefant" / "Elephant". 1 type Dms 905.1 baggage car, with the main design theme of "Ente" / "Duck". The train looks as it did in the early part of 1996. Model: The locomotive is the version with Klatte vents, windows with rounded corners, without buffer streamlining, and without skirting. The locomotive has a 5-pole motor, and the LED headlights change over with the direction of travel. Both trucks are powered. The locomotive and cars have dark wheel treads. The locomotive and cars are in a special edition and are not available separately. Length over the buffers 436 mm / 17-3/16". Especially extensive paint scheme and imprinting with imprinted roofs and window areas. Model: The car has dark nickel-plated wheel sets. Length over the buffers 106 mm / 4-3/16". Prototype: Type ML 3000 C'C' diesel hydraulic experimental locomotive from Krauss-Maffei. The locomotive looks as it did after being rebuilt from 1957 to 1958. It ran in this condition until being purchased by the DB in April of 1964. Prototype: Danish State Railways (DSB) class MY 1100 Nohab general-purpose locomotive. Diesel-electric Europe locomotive from the joint project of GM/NOHAB/AFB. Model: The locomotive has a 5-pole motor. Both trucks powered. The locomotive has dark wheel treads. Length over the buffers 88 mm / 3-1/4". Model: This locomotive comes with a DCC digital decoder and controlled high-efficiency propulsion. Both axles powered. The triple headlights and dual red marker lights change over with the direction of travel, will work in conventional operation, and can be controlled digitally. The headlights are warm white LEDs. The headlights can be turned off at both ends of the locomotive. The locomotive has Telex couplers at the front and rear that can be controlled separately. There is an open view through the engineer's cab and the grab irons are separately applied. Brake lines and switching couplers are included. Length over the buffers 9.3 cm / 3-5/8". This model can be found in an AC version in the Märklin H0 assortment under item no. 36340. Model: The locomotive comes with a DCC digital decoder and extensive sound functions. It has controlled high-efficiency propulsion with a flywheel, centrally mounted. All 4 axles powered through cardan shafts. Traction tires. The triple headlights and dual red marker lights change over with the direction of travel, will work in conventional operation, and can be controlled digitally. The headlights are maintenance-free warm white LEDs. The locomotive has separately applied grab irons on the sides and ends. It also has detailed buffer beams. Brake hoses are included that can be installed on the locomotive. Length over the buffers 18.4 cm / 7-1/4". Bi-level cars for service between Hamburg and Bremen go well with this locomotive and are also being offered under item numbers 23463, 23464, and 23465 in the Trix assortment. This model can be found in an AC version in the Märklin H0 assortment under item no. 37741..
Prototype: German Federal Railroad (DB) class 39.0-2 passenger steam locomotive. With short Wagner smoke deflectors and a Prussian type 2Ž2Ž T 31,5 tender. Built starting in 1922 as the Prussian State Railways class P 10. Version with polished metal boiler bands. Tender with additional wooden boards for the coal bunker. The locomotive looks as it did around 1955. Model: The locomotive has a DCC digital decoder and extensive sound functions. It also has controlled high-efficiency propulsion, and a compact design, maintenance-free can motor. 4 axles powered. Traction tires. The locomotive and tender are constructed mostly of metal. A 72270 smoke generator can be installed in the locomotive. The dual headlights change over with the direction of travel. 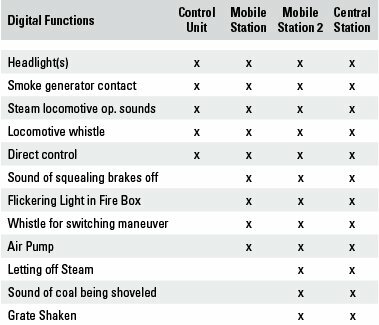 The headlights and the smoke generator, which can be installed in the locomotive, will work in conventional operation and can be controlled digitally. The headlights are maintenance-free, warm white LEDs. There is a close coupling with a guide mechanism between the locomotive and the tender and it can be adjusted for curves. The back of the tender has a close coupler with a guide mechanism and an NEM coupler pocket. Minimum radius for operation is 360 mm / 14-3/16". Piston rod protection sleeves are included. Length over the buffers 26.3 cm / 10-3/8". Express train passenger cars to go with this locomotive, the so-called "Hechtwagen / Pike Cars", are being offered in the Trix assortment under item numbers 23383, 23384, 23385, and 23387. This model can be found in an AC version in the Märklin H0 assortment under item no. 39393. Model: The locomotive has a 21-pin digital connector. It has controlled high efficiency propulsion, centrally mounted. 4 axles powered through cardan shafts. Traction tires. The triple headlights and dual red marker lights change over with the direction of travel, will work in conventional operation, and can be controlled digitally. The headlights and marker lights are maintenance-free, warm white and red LEDs. The locomotive has separately applied grab irons. 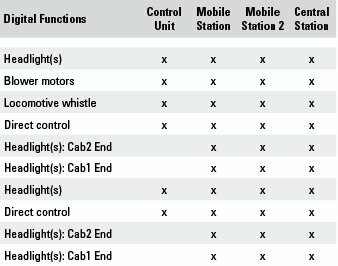 The engineer's cabs have interior details and separately applied control wheels. The roof walks are separately applied. Length over the buffers 18.9 cm / 7-7/16". The passenger car set to go with this locomotive can be found in the Trix H0 assortment under item no. 23486. This model can be found in an AC version in the Märklin H0 assortment under item no. 37012..
Model: The locomotive has an NEM 21-pin digital connector. It also has high-efficiency propulsion. 5 axles powered. Traction tires. The triple headlights change over with the direction of travel. The locomotive has NEM coupler pockets. Length over the buffers 18.6 cm / 7-5/16". Model: The locomotive has a DCC digital decoder and extensive sound functions. It also has controlled high-efficiency propulsion with a bell-shaped armature and a flywheel, mounted in the boiler. 4 axles powered. Traction tires. The locomotive and the tender are constructed mostly of metal. A 7226 smoke generator can be installed in the locomotive. The triple headlights that change over with the direction of travel and the smoke generator that can be installed in the locomotive will work in conventional operation and can be controlled digitally. The headlights are maintenance-free, warm white LEDs. There is a close coupling with a guide mechanism between the locomotive and tender. It can be adjusted for track radius. Close couplers with NEM coupler pockets and guide mechanisms are mounted on the rear of the tender and on the front of the locomotive. Minimum radius for operation is 360 mm / 14-3/16". Piston rod protection sleeves and brake hoses are included. Length over the buffers 27.5 cm / 10-13/16". A tank car set to go with this locomotive is being offered under item no. 24112. This model can be found in an AC version in the Märklin H0 assortment under item no. 37927. Model: The cars have underbodies specific to the different car types. The trucks are Minden-Deutz heavy designs, with disk brakes like the prototype, with and without magnetic rail brakes depending on the car type, and with and without side stabilizers and separately applied generators depending on the car type. All of the cars are ready for installation of the 66718/66719 lighting kits and the 73407 marker light kit. Total length over the buffers 84.8 cm / 33-3/8". AC wheel set per car 4 x 700150. The right motive power to go with this car set is the class 110.3 electric locomotive, which you can find under item no. 22667. This model can be found in an AC version in the Märklin H0 assortment under item no. 43869. This model can be found in an AC version in the Märklin H0 assortment under item no. 46546, but with different car numbers. Prototype: German Railroad, Inc. (DB AG) class 110.3 electric locomotive with streamlined ends ("Pants Crease"). 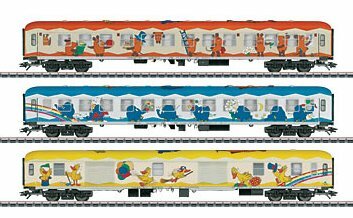 3 different design German Railroad, Inc. (DB AG) express train passenger cars, with different advertising themes. 1 type WGmh 824 entertainment car, with the main design theme of "Maus" / "Mouse". 1 type Bm 235 compartment car, 2nd class, with the main design theme of "Elefant" / "Elephant". 1 type Dms 905.1 baggage car, with the main design theme of "Ente" / "Duck". The train looks as it did in the early part of 1996. Model: The locomotive has a digital connector, a motor with a flywheel, and all 4 axles powered. It also has a close coupler mechanism. The pantographs work mechanically and electrically. The locomotive is the typical version in Era IV with buffer beams without streamlining, individual side vents, and altered rain gutter. The locomotive and the cars are in a special edition and are not available separately. Length over the buffers 598 mm / 23-1/2". One-time edition on the 40th anniversary of "Broadcast with the Mouse". Prototype: German Federal Railroad (DB) class 44, 2-10-0 design. Built starting in 1937 as a standard design locomotive for the DRG. Use: Heavy freight trains. Model: The locomotive and the tender are constructed of die-cast metal. The locomotive has a powerful can motor with bell-shaped armature and a flywheel, built into the boiler. 5 axles powered through side rods. Traction tires. The locomotive has a digital decoder for DCC, Selectrix, and conventional operation, and it also has automatic recognition for conventional DC operation. The headlights change over with the direction of travel, will work in conventional operation, and can be controlled digitally. There is a close coupling between the locomotive and tender, and there is a close coupler mechanism on the rear of the tender. The smoke box door can be opened. Length over the buffers 141 mm / 5-9/16". The class 44 was built from 1926 to 1949 and is thereby one of the standard design locomotives built over the longest period of time. A total of almost 2,000 units were built. In Germany the legendary 44's formed the backbone of the heavy freight train service for many years. In addition, they were used in several European countries. A locomotive with tender ready for service weighed a proud 185 metric tons. The technically demanding three-cylinder running gear transferred the output of 2,000 horsepower to the rails. Prototype: TRAXX DE diesel electric locomotive as the CB Rail class 285, leased to ITL. Built by Bombardier starting in 2007 as a locomotive from the TRAXX 2E program of locomotives. Use: Freight service. Model: The locomotive has an NEM digital connector. It also has a 5-pole motor with 2 flywheels. 4 axles powered. Traction tires. The locomotive has a close coupler mechanism. Length over the buffers 118 mm / 4-5/8". One-time series in 2011 for the Märklin Exclusiv Program. TRAXX Locomotives. Locomotives from the TRAXX (Transnational Railway Applications with eXtreme fleXibility) type family built by Bombardier are in operation everywhere in Europe today. In 1994, the AEG experimental 12X locomotive appeared, which then underwent testing as road no. 128 001 on the DB. The real success story began in 2000 however. 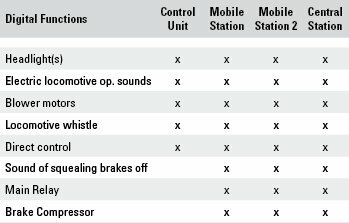 Bombardier introduced the multiple system version: The class 185 was also designed for the power current systems of neighboring railroads. A total of 400 units of the class 185 are to be purchased. Depending on the country they will be used in, the locomotives are being equipped with the correct train safety systems and with electrical equipment as a "package". So, there are locomotives with two or four pantographs and different contact wiper widths as the most noticeable external difference. There are also many class 185.1 locomotives on private railroads. And, there is a class 146.1 160 km/h / 100 mph fast version of this locomotive for commuter service. The TRAXX family locomotives delivered starting in 2005 formed the next evolutionary step on European railroads: They were equipped with locomotive bodies with improved ability to withstand crashes; the shape of these locomotive bodies looks more powerful and brawnier at the ends. Other changes have to do with the electrical rectifier layout. Railion is presently putting 200 of these locomotives into service as the class 185.2. There is also a commuter service version of this locomotive for 160 km/h / 100 mph, the class 146.2. The German Railroad, Inc. is not the only eager buyer of this family of locomotives with an eye for the future. The SBB and many privately owned railroads such as the Swiss Crossrail are placing different models of the various series into service. The TRAXX 2E type program as the current evolutionary step now also enables a diesel electric TRAXX version that shares essential components with the earlier electrical versions. The privately owned railroads are the pioneers for the use of these diesel locomotives. The TRAXX DE locomotive is being used on the HVLE as the class 285 in freight service, but it's also being used on the "metronome" Railroad Company LLC as the class 246 pulling bi-level passenger trains on non-electrified routes.